I just switched over to Feedly. It synched up well with my Google reader and everything moved over no problem. I just have to explore all the options now and get used to it. I tried Bloglines and it wouldn't sync with the zipfile I got from Google Reader. I would have had to type in all the URLs all over again, and I had too many to fool around with. Bloglines still exists? I used that before I used Google Reader. NewsBlur's servers are currently down. I was going to try them first. I think I will wait until this weekend for servers to adjust. Google did announce this three months in advance. Sad, sad news! For those of us (like me!) who are not so tech savvy), google changes things way too often. I hope you'll share which reader you decide to use and why you chose it over other options, please. Probably won't help you but I use an RSS reader called Lightread which works with ubuntu linux. Maybe they have a mac or windows version. LightRead is very similar in style to a Mac RSS reader called Reeder. Doesn't LightRead require a GoogleReader account to work? 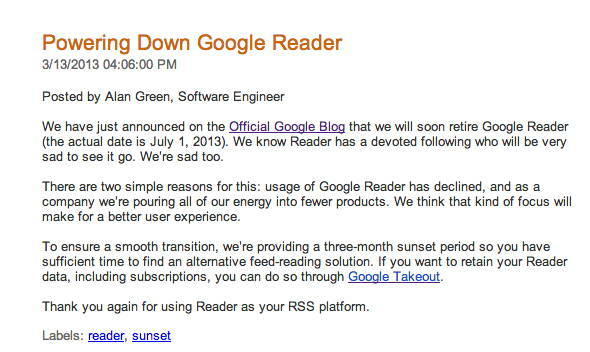 If that's the case, once GoogleReader disappears, unless they've found a replacement, LightRead won't work. I suspect they will choose one of the other cloud-based Readers to sync with, and help their users migrate all the accounts before the July 1 end date. One article online I read stated that *all* offline RSS readers synced with GoogleReader. I was a little surprised by the use of the word 'all,' but if it is the case, anyone using an offline reader will have to hope their software finds someone else to sync with. I switched to Feedly this weekend after reading about it on michaelhyatt.com. It took a little getting used to but I like it as much, if not better than Google Reader. The key is finding the right view.